Kelly the Culinarian: "It's Either Fast or Fun"
On the way to the F^3 Half Marathon Saturday, run club buddy Keith shared some valuable advice that I wanted to share (and document so I don’t forget it). Something you should know about Keith: He’s run 57 marathons, and while his fastest was 3:30, he’ll regularly run marathons back to back and come in within seconds of his standard time. The guy runs. A lot. Consistently. And that, friends, might have been the best race day strategy pep talk I’ve ever heard. It rings true with all my experiences – a mile six of Circular Logic last year, I knew I was toast. Despite all my preparation, it wasn’t going to happen. Then six weeks later at the Vermont City Marathon, I knew by mile two it was happening. I felt strong and started pulling away from my pace group. How soon do you know if it’s going to be a fast or a fun day? So I didn't know Keith was in your run club group. Yes, he is a marathon crazy maniac for sure! Great advice though. I know what I'm trying to PR for...but I also know within a couple miles whether I should try or not. 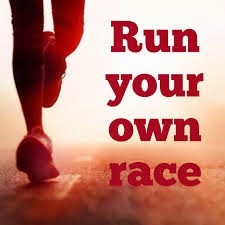 There are so many factors that come into running a race and sometimes you don't know until race day, what that will be!! I feel like the worst races I've had, I didn't know until halfway through. For my first half, I felt great until past the halfway point, I think about mile 7 the wheels started to come off. The only time I ran the Hot Chocolate 15K, a few miles in, I had stabbing pain in the side of my knee (due to a tight IT band I believe ... never came back once I started foam rolling). The Rock 'n' Roll Half this year sucked, but I knew it would because of my emo knee. I think around mile 3 it started going downhill. Otherwise, I usully start races pretty conservtively and ramp it up, so I don't have many bad races, to be honest. And I also generally don't have stomach issues, thankfully. It's just this stupid knee right now. Awesome advice! I do think mile 1 May be a bit early to call it though. I think for a half marathon mile 3 is when I know. Also, I always try for fun and happy even if fast ;) that weather was a miracle! The best advice I have been given is to have fun, high five the kids and thank the volunteers.